Saturday 28th June 2014, Derby College. Sarah Le-Good, Assistant Vice Principal for Social Inclusion, opened what was to become a pivotal Conference. She warmly welcomed everyone to Derby College as host and expressed her thanks to all involved in arranging the event. Sarah passed the conference to Jill Bussien, NATED vice chair, and Maria Bailey, conference organiser & ACSW treasurer, who proceeded with the formal welcomes and offered thanks to this year’s Silver Sponsors: Deaf Umbrella and 121 Captions. Jill led the NATED AGM whilst Maria led the ACSW AGM. ADEPT was then duly launched, and the new website unveiled to great interest and enthusiasm. Maria expressed her regret that Andy Owen, ACSW vice chair, was unable to attend the conference due to sudden ill health. Thanks were expressed to Andy who had invested a great deal of time and effort in the new website. All joined Maria in wishing Andy a speedy recovery. Formal proceedings over, the first presentation was given by Robin Ash, Empowerment and Campaigns Officer with the BDA. Robin’s presentation was entitled ‘Deaf Education Today: A Lost Generation?’ Robin presented a brief overview of the work that the BDA do and gave an insight into his role. We were given a concise history of deaf education, then brought up to date with current research, including the BDA Charter for British Sign Language and the Deaf Studies curriculum (www.nationaldeafstudiescurriculum.com ). Robin encouraged people to get involved with the campaigns and the work of the BDA, with the warning that, unless we work together, there will be yet another lost generation. A powerful presentation from a very charismatic man. Very informative, and interesting. Good to see some improvements but not enough. Amazing that there are so many Deaf pupils without role models. YES YES YES! Thank you for confirming my feelings in that mainstream Deaf children don't know what’s out there for them! Fantastic presentation, a true insight into the deaf perspective. The second presentation was on the NDCS Stolen Futures Campaign, given by Brian Gale and Freya Riddel. They presented an overview of the campaign, linked to current changes in policy, including the Disabled Students Allowance (DSA) and Access to Work (ATW). Brian and Freya presented a clear picture of what is being done, from local campaigns, to debates in the House of Commons. Brian and Freya presented some very thought-provoking information and proved once again how much work is done by the NDCS. Very good. A chance to catch up with what's happening and threats to Deaf young people’s educational experiences. Interesting to know current state of play re: DSA issues and implications. Useful information to have and to look into when I'm back home to share with my team. 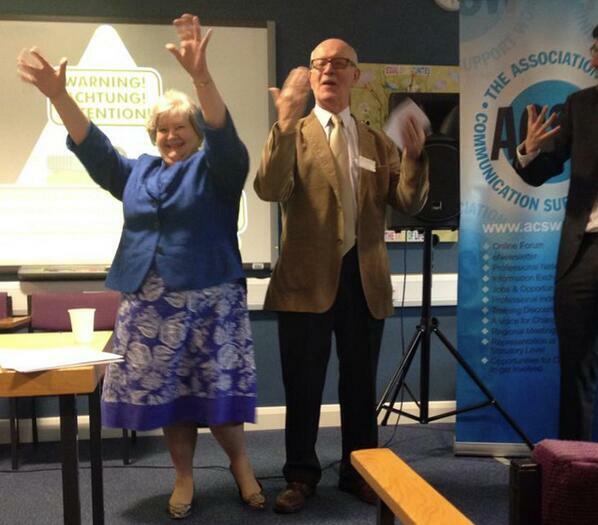 Next keynote was by the guests of honour, legends in the Deaf community: Wendy Daunt and Jerry Hanifin. They regaled conference with tales of their own educational experiences. Jerry was extremely comical as always, yet we all felt his despair as he relived his heart-wrenching early educational experiences. The audience was spellbound through this roller coaster presentation that had us clutching our sides with laughter, then experiencing real tears. The allocated twenty minutes ran on for almost an hour, yet no one was concerned with the time. We all knew how fortunate we were to witness this legendary duo open their hearts. Wendy then expressed her thanks to delegates for all their work with deaf students, adding that she had watched CSWs working, and was very grateful. Wendy ended her presentation poignantly by stating that, if CSWs had existed when she was younger, she may have achieved so much more at school. How very humbling for us all. Amazing! Key presentations should be like this! From the heart and real! It has really made an impact on me. WOW! What an emotional rollercoaster? It was like meeting Deaf Royalty! Incredibly Memorable. Amazing! One of the most emotional speeches I have ever heard. Some of the comments made by Wendy regarding CSWs were heart warming. Thank you for being so open and honest. I found tears involuntarily and uncontrollably rolling down my face. Thank you for reassuring me that I am in the right position in raising tomorrow’s champions! The final presentation of the morning was given by Martin McLean, I Sign Project Manager with the NDCS. Martin gave an overview of the Project and explained the various strands, including the CSW bursary fund, where CSWs working with deaf children were awarded funding to improve their BSL skills. Martin explained that as part of the scheme, Maria Bailey provided beneficial 1-1 support to CSWs throughout their BSL training. Martin also informed delegates of the development of a qualification for CSWs working in Pre 16 educational settings. This qualification has been developed by Signature as part of the I Sign project and is currently being piloted by UCLAN in the North West and ERADE in the South West. Following evaluation, this qualification will be available nationally. Martin concluded his presentation by outlining the latest development: The Signature study into the role of the CSW as part of its NatSIP/BSL Coalition work. For more information contact Gillian Marshall Dyson at Signature. Despite having to follow Wendy and Jerry’s charismatic keynote, Martin had the attention of conference and was informative, thought-provoking and well-received. Hadn't heard of this, so it was interesting. Great to know what projects are happening/ their outcome. This was very interesting, I will be sure to follow up with further research. Clear Presentation of purpose of I Sign Project. As a result of the overrun of the main speakers, no time remained for the planned Question & Answer panel, so conference broke for lunch. The afternoon offered a range of workshops, as shown below:. The final session of the day saw the nomination and election of adept’s committee. Jill Bussien was elected as chair, Andy Owen as vice chair, Lisa Peacock as secretary, Nigel Kerwin as membership secretary and Maria Bailey as treasurer. Brilliant Day! Very informative, lots of websites to explore now! Thank you so much! Really glad I came, good to feel supported as a professional and I've been given plenty of food for thought to reflect on how I can improve my professional working practice. Thank You to Everyone! Susanne is founder of iDID Adventure, CEO of DDDA Solutions and an award-winning consultant specialising in equal access to the adventure industry. Passionate about deaf education, Susanne works with deaf and disabled individuals to inspire leadership. Susanne discussed the importance of promoting independence amongst deaf students. Susanne provoked some thought to enable delegates to explore how bad experiences in communication support can have hugely detrimental effects on deaf learners. The workshop also looked at ways in which professionals/ institutions can empower deaf students to excel and aspire to achieve in education. (Deaf Education), NATED and ANP Committee Member. Melanie has worked in education support for the past fifteen years, supporting D/deaf and disabled learners in FE and HE. She currently works in widening participation supporting D/deaf and disabled learners throughout their transition into higher education. Melanie educated delegates about the NOTE template, one of the unexpected outcomes of Melanie’s doctoral research looking at the experiences of D/deaf learners who have been supported by notetakers during their university education. The format can be used for both manual and electronic notetaking and encourages the learner to add their own notes and review the summary pages regularly. This may enhance their learning and assist in developing deeper learning. Elaine has an MA in Deaf Education and is qualified in Deaf Relay. She has worked as a Deaf Tutor, at a further education college for eleven years. Elaine also delivers Deaf Awareness training across the UK and is a BSL tutor and Signature assessor. Topic: Deaf Relay - What is it? In this popular workshop, Elaine discussed the role of a Deaf Relay, which is ‘to ensure that communication is clearly transmitted and understood by all participants involved in an interaction’. Deaf Relay is relatively new in the UK; there is not enough information or understanding about the role. Although a Deaf Relay can work in many different forums, this workshop centred on how the process works in education. Through discussions, role play and short film clips, delegates looked at how a Deaf Relay can co-work with Communication Support Workers (CSWs) to support Deaf learners in the classroom. Topic: The Professional CSW- which qualifications are right for you? This workshop explored the range of training courses currently available for CSWs, including the Signature Level 3 CSW and Deaf Umbrella’s own Level 4 CSW course, validated by the University of Greenwich. Katie Lomax from Deaf Umbrella gave an insight into current CSW training and explained about their Level 4 course. Delegates were made to think carefully about many issues and were also guided through various CSW training options, to find a route suitable for each individual. Osborn teaches a variety of IT courses to deaf students at City Lit, London. Co Presenter: Shirley Farthing. This workshop was very practical and was useful for any CSW and other professionals worksing in education with deaf students. The workshop provided BSL signs for many of the myriad of technological terms that we are all faced with from time-to-time. Delegates were able to increase their technological vocabulary in BSL in a fun and interesting way. So much to learn that the workshop ran over time. Jill is a Teacher of the Deaf, and new Chair of adept. What is involved in moving from one educational institution to another? What are the new procedures, funding and the law? What pitfalls are involved: lack of time, lack of appropriate staff, problem learners, frustrated parents, college management, etc.? What information do we need to support the learner at their new school/college/university? How can CSWs / Notetakers / Interpreters ease the situation for the learners? How do we have a laugh on the way, so we can stay sane? So many questions, but the workshop provided many answers from the new chair of ADEPT.